Today I’m sharing how you can throw together a last minute weeknight dinner party in an hour (or less) using the absolute best frozen dinner entrees. If you’ve ever tried Michael Angelo’s dinner entrees, then you know exactly what I’m talking about! Sara Agnello started Michael Angelo’s in the 1980s as a way to share her delicious home-cooked meals with other busy families. Aside from yummy meals, my favorite thing about this company is their philosophy on their products: no preservatives, no fillers, and no artificial ingredients. When you taste these meals you can immediately tell that real, authentic ingredients are prioritized. 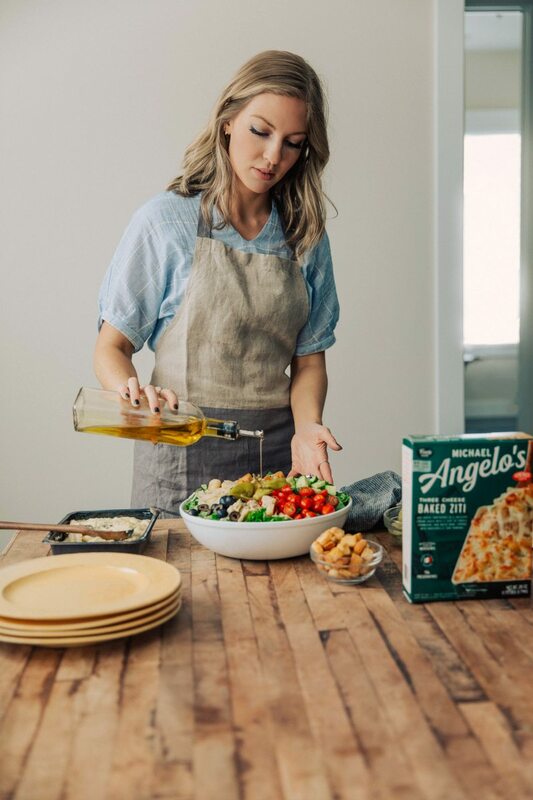 You can find Michael Angelo’s meals in various portion sizes: single-serve entrees are perfect for a single meal, and the family size is great for 3-4 people. 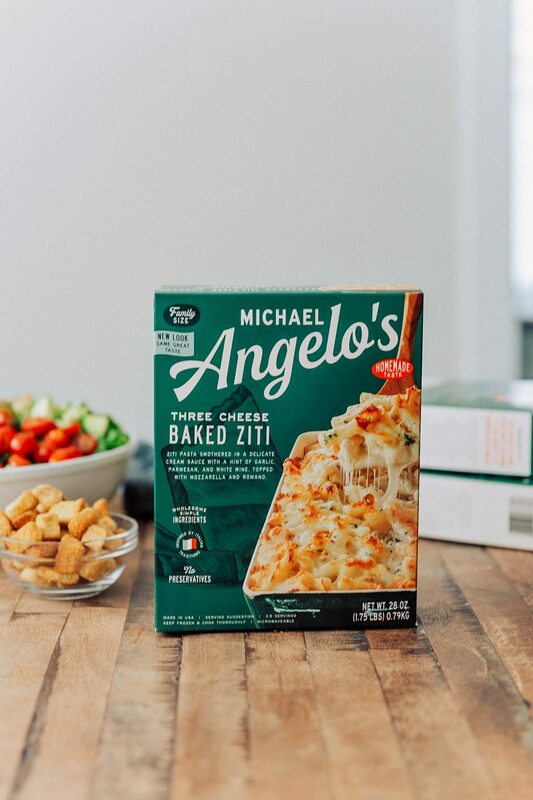 You can find Michael Angelo’s in green boxes in the frozen foods section of your grocery store. If you’re throwing a simple weeknight party, I’d recommend grabbing 4-5 of the family-sized entrees, baking them all, and then placing them all on a table so people can serve up a few of their favorites. Our favorite entree is the Three Cheese Baked Ziti! And while the entrees are baking, you can toss together this simple Italian salad. 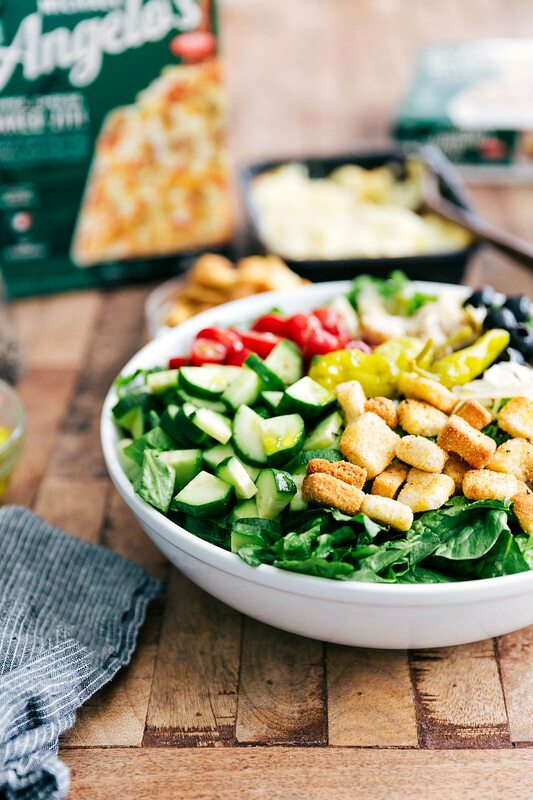 It’s a versatile salad and you can customize the veggies to include all your favorites. Some of my favorites are: red onion, banana peppers, grated carrots, sweet peppers, and green peppers. 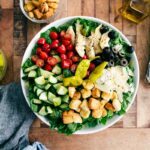 This Italian Salad is light, healthy, and easy to make! 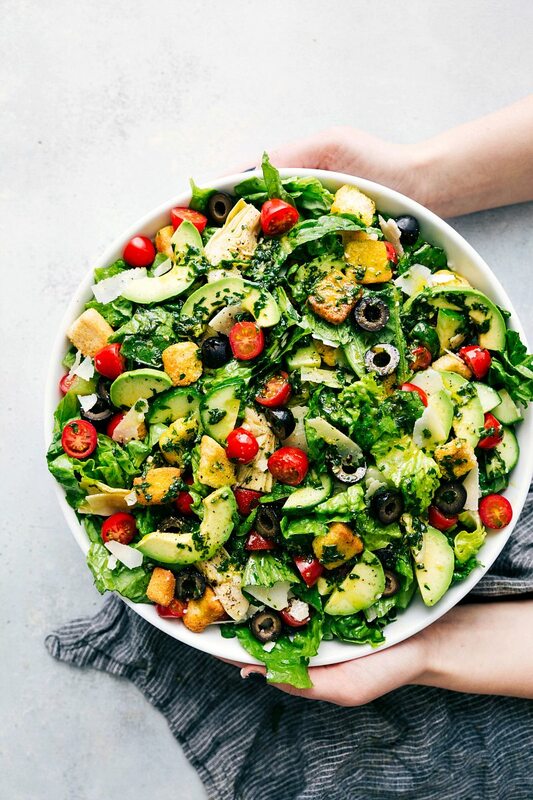 Make the dressing: Combine the chopped parsley, chopped basil, oregano, garlic cloves, red wine vinegar, sugar, salt and pepper (to taste, I use 1/4 teaspoon pepper and 3/4 teaspoon salt) in a food processor or blender and pulse to combine and chop the herbs. Slowly drizzle in the olive oil and pulse until combined. Don't over pulse/mix or your olive oil can become metallic tasting. Place in the fridge in a mason jar while preparing other ingredients. Shake to recombine dressing ingredients as needed before adding to the salad. 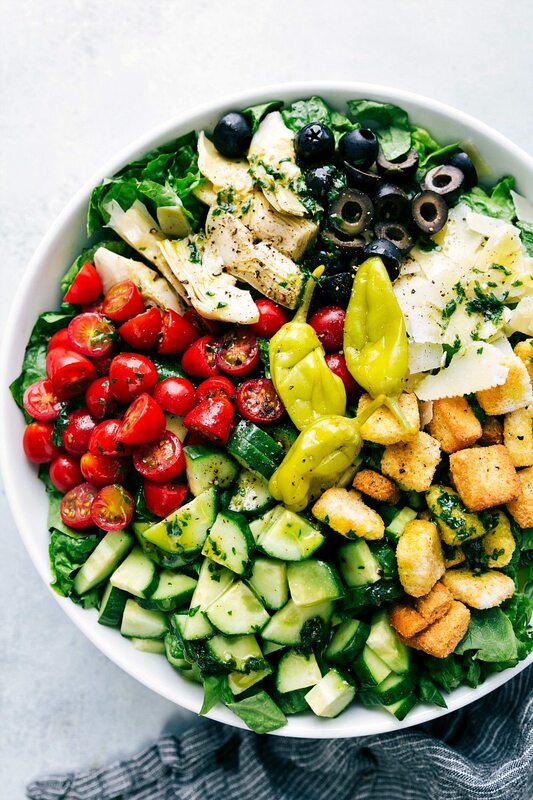 Place the following salad ingredients in a large bowl: the chopped lettuce, cucumbers, artichokes, tomatoes, olives, and pepperoncinis if desired. Right before serving, add about half of the dressing, avocado, parmesan cheese, and toss well. Add more dressing as needed making sure to very generously coat the lettuce (you'll likely use more dressing that you think to really get the flavor perfect!). Add some more salt and pepper to taste to the salad and finally top with croutons. Serve immediately. *Only add avocado, dressing, and croutons to the amount of salad that will be finished immediately. This salad doesn't sit well with the dressing. Additionally the croutons will get soggy and avocado will brown in any leftover salad. Excited to try Michael Angelo’s options. We always keep freezer options on hand for quick weeknight meals — I wish I was cool enough to be hosting a mid-week party! — but these look like great meals to have on hand that I can feel good about feeding my kids. Thank you! 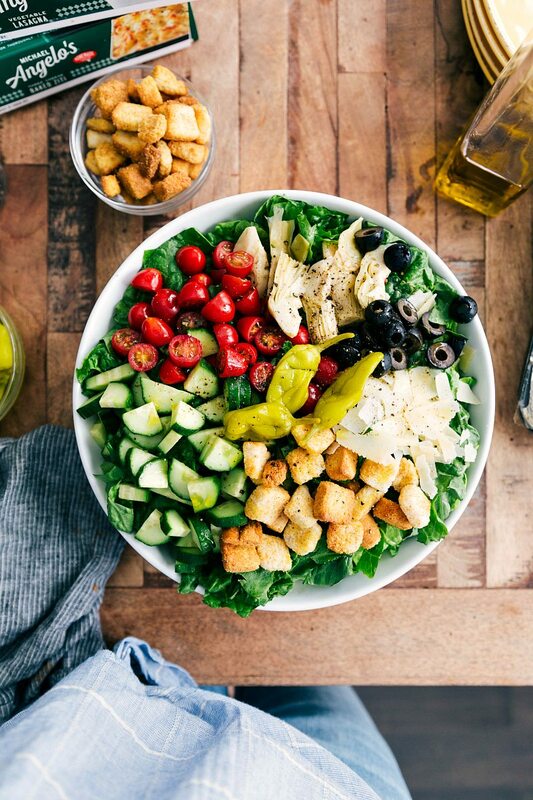 Your dressing is amazing. Love it!